Breakfast can be a time of great nutritional misinformation and in fact because it’s often so time pressured we do tend to go back to old, tried and true staples. 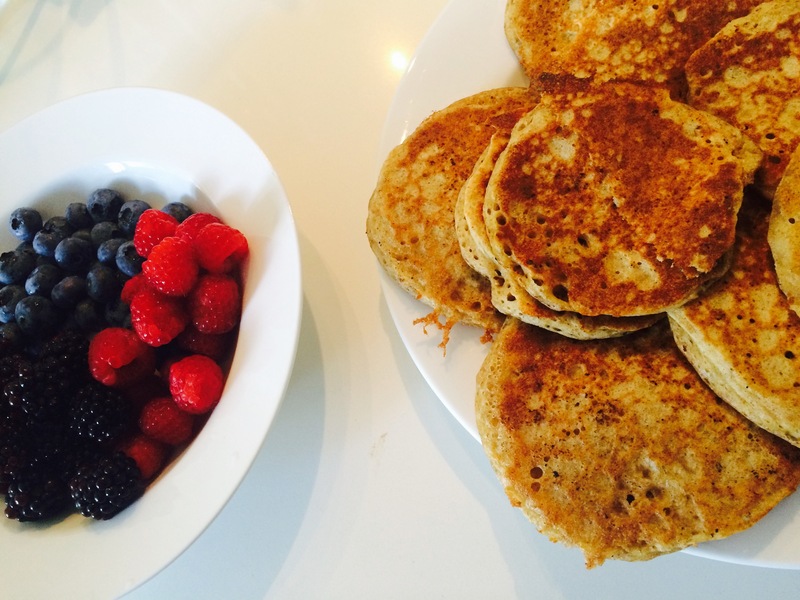 Breakfast need not be a headache, with a little bit of planning, food can be easily made in 10-20 min. I’ve got the luxury of not having to rush out of the house, so I can make my family a healthy breakfast most mornings. However, even if you do indeed have to join the commuter rush, there is always time for fruit, porridge or a piece of sourdough toast with almond butter. In our household there are some firm breakfast staples and mostly I’ve banned any kind of boxed cereal. Although when my husband needs to rush to work he will eat flakes and my kids consider corn flakes a treat. We like poached eggs on sourdough bread, kefir smoothies, eggs and soldiers, omelette and the well liked sourdough pancake. With the last of the berries ripening now, you could forage for some blackberries and serve them on these delicious pancakes for a special Sunday morning breakfast. Mind you sometimes my kids eat these for an easy dinner combined with a simple soup. Sometimes I make these pancakes savoury and grate some courgettes or other vegetables in or leave them plain and serve them to dip into a stew. The batter is incredibly versatile, very light and easy to prepare. Once you’ve got your sourdough starter you are set. The reason why I favour my grains fermented, is because the fermentation process pre-digests the grain. This means that the lactobacilli gobble up carbohydrates in the flour and turn them into nutrients we can assimilate more readily in our bodies. Enzymes in the grain are activated in this acidified environment and break down anti nutrients like phytates. As a result the dough contains more B vitamins, folate and lactic acid (which makes the dough sour). Non fermented grains, made using yeast, are not particularly good for our digestive system and have potentially lead to many digestive diseases we hear of today. A fermented grain is basically been left in an acidified, warm moist environment for 8-24 hours. The longer you leave it, the more sour it will get, and the more nutritious too. I like to ferment my grains between 8-12 hours in most cases, making the taste only slightly acidic. Although sourdough is often referred to as gourmet or novelty food, I like to remind people, that until 130 years ago all flour products were made this way: water, flour, leaven and time. 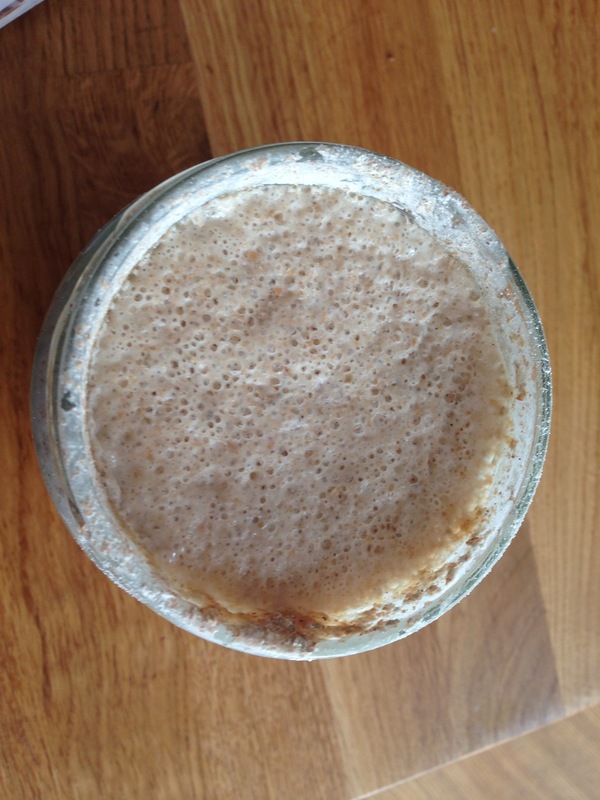 A leaven or sourdough starter is simply a slurry of water and flour which has been left out in the warmth to naturally ferment. A starter can be maintained for a life time and can be passed on for generations. Fear not, in the likely event that you kill your starter, a new one can be made just as easily. In a 500 ml jar mix half a cup of flour and 1/2 cup of water to make a fairly runny slurry. If the batter is too thick or thickens up over the course of a day, just add some more water . Its important to use filtered water and I favour organic rye flour, although any flour will do. Leave in a warm place with the lid off, covering the jar with a paper towel or muslin cloth to keep flies out. After 2-3 days add 2 tablespoons of flour and some more water, keep stirring. Once the batter is bubbling vigorously (after 3-7 days), add another 1/2 cup of flour and water. Leave the starter out for 3-4 hours and then use it or keep it in the fridge with the lid on until your ready to use it. Everytime you use some starter, simply replace the amount you have used (so if its 1/2 cup of starter then add 1/2 cup of flour and enough water to make a slurry) and leave the jar to ferment some time in the warmth, after that it can go back in the fridge until you need to use it again. Mix the flour, water and sourdough starter thoroughly in a bowl and leave for 8-12 hours, preferably in a warm spot with a lid on the bowl. If you don’t have a lidded bowl simply drape a tea towel over it. I usually leave it over night to make pancakes for breakfast. Once its been left to ferment you then add the egg, banana and baking soda just before cooking. The baking soda will neutralise the acidity in the dough and make it nice and fluffy. Make sure that both the egg and banana are well mixed into the dough. Use coconut oil for frying (butter and ghee are good too) and cook small amounts of batter in batches. I use a cast iron skillet and am quite generous with my coconut oil. I make small pancakes, roughly the size of the palm of my hand, and you should get roughly 18 pancakes from this amount of flour. If you want to make this vegan, just omit the egg and it will still taste very nice. 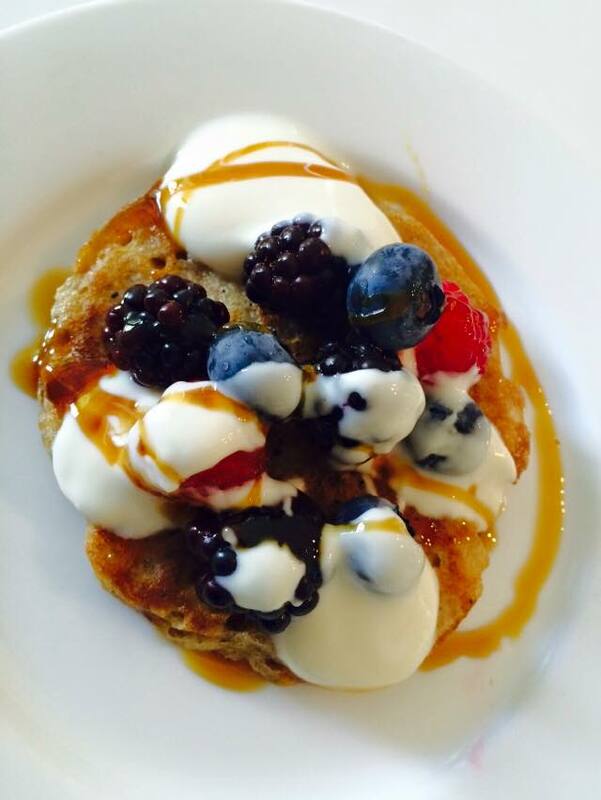 Serve with any topping you like, fresh fruit, yoghurt and coconut syrup is our favourite way. I’m on a two-week holiday in Greece at the moment and lots of things are fermenting and ruminating in my mind, narrowing it down to a succinct thread is my usual challenge. Considering we are in the middle of a greek financial crises, no jobs etc, its business as usual here in Mykonos, and I’m guessing on most of the islands for that matter. I’m not going to talk about the economic climate, nor will I reflect on how this affects the greek but I imagine that this isn’t the first hardship the greek have faced and survived, for this is a fiercely proud and hardy bunch. As the burly vegetable vendor reminded me when I asked him for a soft avocado “people here in Mykonos like their avocados hard not soft, we Greeks are strong, sorry about this madame” I smiled and got myself a hard avocado, plus a discount which he’s seems to enjoy giving freely. Burly he may be but with a heart of gold. In fact on several returns to his stall, I’m now welcome like a long-lost relative and he assures me that all his produce is grown in `Greece. There is a strength here, a pride and fierce independence. These qualities are also reflected in the harsh lunar like landscape, where not much seems to grow, yet on a closer inspection the countryside harbours pockets of the most exquisite herbs, wild greens and olives of course. There is life here, hidden but strong. To survive on these isles, people had to live off the land very simply and grow everything themselves. Their diet is based on an abundance of vegetables, pulses, herbs, olive oil, some dairy products (mainly sheep/goats cheese), honey and very little fish and meat. The climate here is temperate and due to the rich soils and long sunshine hours, produce is very flavoursome. Most restaurants we visit also have their own vegetable garden and the menu shows them prepared in many imaginative ways: courgette patties, grilled vegetables, marinated charcoal aubergines drizzled with local honey, greek salad, okra in tomato sauce, you get the drift. 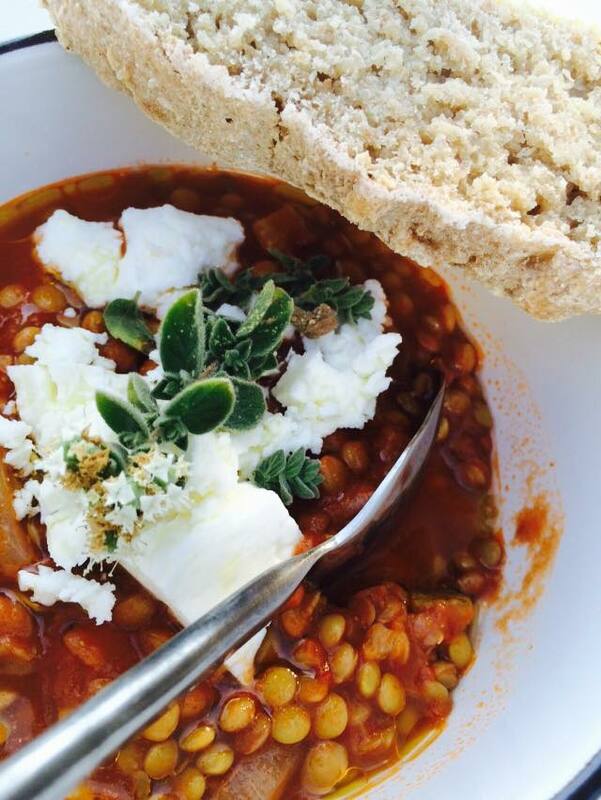 So when I next visit my now friendly vegetable vendor I dive into some of his beautiful wares and out came this lentil stew. A simple but nourishing affair, served with some homemade sourdough bread (Yes my starter went on holiday with us too! ), drizzled with olive oil and feta, and a view of the deep blue sea. Life really doesn’t get much better than this. Garnish with a drizzle of extra virgin olive oil and some crumbled feta. If you leave the feta out, this dish is essentially vegan. You can add all sorts of vegetables, depending on what you have got in your fridge. As an alternative to courgettes you can use carrots, celery and fennel during the sautéing phase and towards the end of the cooking process you can add some greens like spinach in summer or kale in autumn/winter.